Thomas E. Bitterwolf died suddenly at his office on the University of Idaho Campus on Wednesday, January 30, 2019. He was 72. Tom “Doc” Bitterwolf was born in New Orleans, LA on January 19, 1947 and it was certainly the experience of growing up in a fun loving city with caring and nurturing parents, Alvin J. and Naomi M. (Hendrix) Bitterwolf, that shaped his joie de vivre attitude toward life. Tom attended Centenary College in Shreveport, LA and it was there in the first couple of weeks he met Carrie at a freshman barn dance. That was the start of a 54 year romance that continues to this day. Tom and Carrie were married the day before their college graduation and began a wild ride through life that can only be described as charmed. Orlando, FL; US Naval Academy Annapolis, MD Military and Civilian Professor of Chemistry; USN Reserve numerous locations; Retired rank: Commander. Tom created a one-man research program at the Academy that proved to be sufficiently visible and productive to land him in what has proven to be his dream job as a Professor at the University of Idaho. Over his 30+ years at Idaho Tom has had the honor of teaching thousands of the finest students in the Northwest. His office walls are covered with wedding and birth announcements, graduation photos and scores of pictures of his academic grandchildren. Tom has had a good many professional, academic and service organization roles. The one he is most proud of is his participation in Boy Scouts where he has been able to mentor young men and train adult leaders to be thoughtful, caring leaders of boys. With Carrie as his constant companion and his two wonderful daughters and their kids plus scores of four legged children and even a pet dinosaur to give him joy, Tom lived life to the fullest. The curve ball of cancer at the end only served to spotlight just how rich and rewarding his life had been. Tom was preceded in death by his parents and grandparents. The family asks that memorials be sent to the University of Idaho Foundation for the Renaissance Fund to support the activities of the University Honors Program. 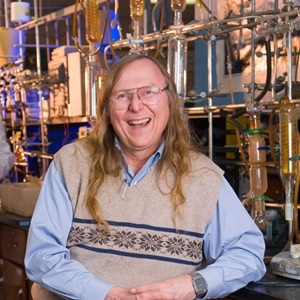 A party celebrating Tom’s life and helping to deplete the 1000+ bottles of wine in his cellar, working with the Chemistry Department to arrange for the celebration of life party Tom wanted in lieu of a funeral service. It will be held on Friday, February 8, from 2:00 pm to 4:30 pm at the Vandal Ballroom in the Pitman Center.